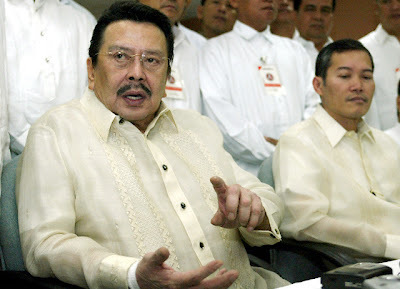 On Wednesday, September 12th an anti-graft court found former Philippine President Joseph Estrada guilty of plunder and sentenced him to life imprisonment. The jailing of former president Joseph Estrada for massive corruption is a warning for the nation's political elite but means precious little for the legions of poor, analysts say. In a country riddled with corruption and dirty politics, Wednesday's guilty verdict failed to ignite any semblance of the anger that followed his removal from power in 2001, when 300,000 people rallied to his side in the streets. Then, his successor, President Gloria Macapagal-Arroyo, called in the Army to quash the demonstration, which she said was an uprising aimed at toppling her. Four people were killed and more than 100 arrested. Enrique Esteban, a political scientist with the University of Asia and the Pacific, said that while Estrada still has popular support with the poor, they simply do not see the point of taking to the streets any more. "They see it as part of the political game no matter what side you are on. At the end of the day the poor are still poor," he told Agence France-Presse.